It’s taken me a week to write this post, and it’s a shame, because this meal was one of the most wonderful surprises I’ve had in a long time! I was back in South Carolina to visit with friends and to see my Clemson Tigers win their sixth game of the season, and we decided to grab lunch in Greenville after I landed at GSP! It was my choice – uh oh! So, I turned directly to the Yelp! app on my iPhone. 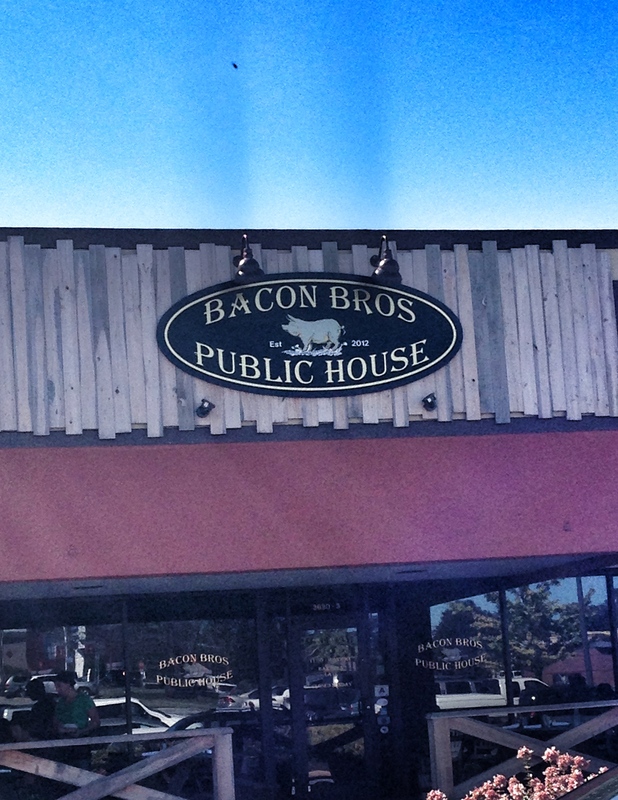 We found Bacon Bros. Public House in a small strip mall. We would soon discover that this is a hidden gem on Pelham Road! We waited for a few minutes for an outside table, and for Greg to arrive. As we waited, I was able to check out a bit of the restaurant’s atmosphere. 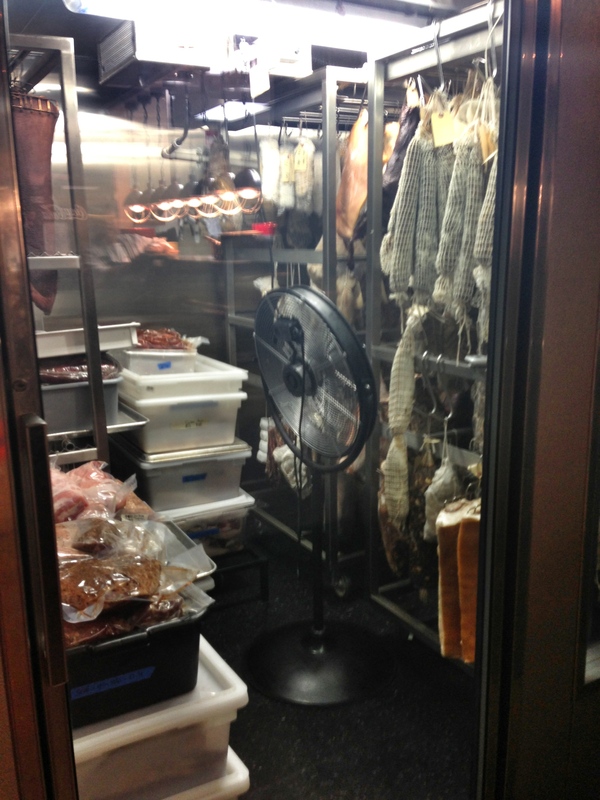 The meat locker immediately caught my eye. It was nice to be able to see the (locally sourced!) pork, beef, etc that would be served up. Not that I’m generally suspicious of restaurants, but transparency like that really inspires confidence in my mind. I’d also like to give shout-out to the beautiful sink in the ladies’ room. I didn’t take a picture, but it was a very nice sink/faucet. When we sat down, we were warmly greeted by a gentleman who poured us water. His voice was so calm and sweet that I found myself (somewhat jokingly) asking him to sit down and join us! He politely declined, since he was at work, but he clearly had a good sense of humor about it. We were then greeted by yet another gentleman (hey, this is the south, y’all!) who “threatened” to sit down and join Cindy and me if Greg didn’t show up soon. Greg did show up just moments later. In the meantime, at my request, a third gentleman, in the form of our server, Tanner, chose a red beer for me. From start to finish, Tanner proved to be a really engaging and attentive server. He added to the overall experience in a very positive way. He then chose my lunch. Tanner was very cool about the whole process – not a single flinch. 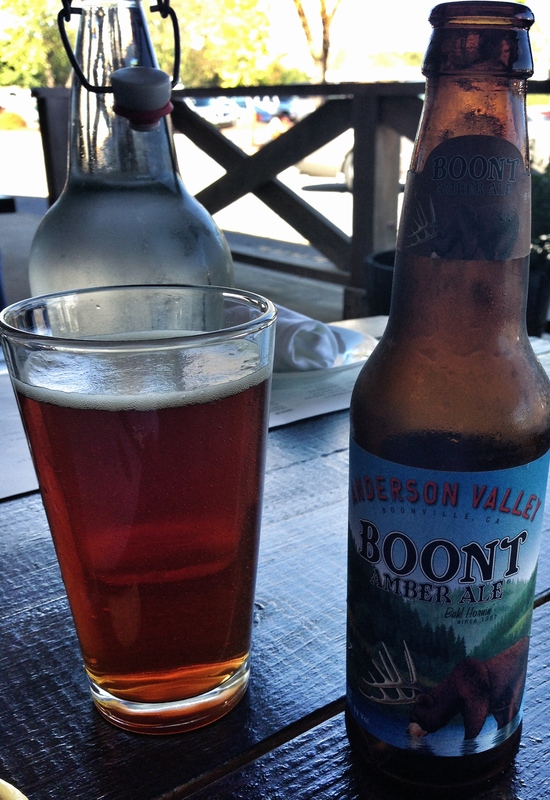 It was clear that he and the other gentlemen that work at Bacon Bros. not only know the menu well, but are confident in the food that’s being served. 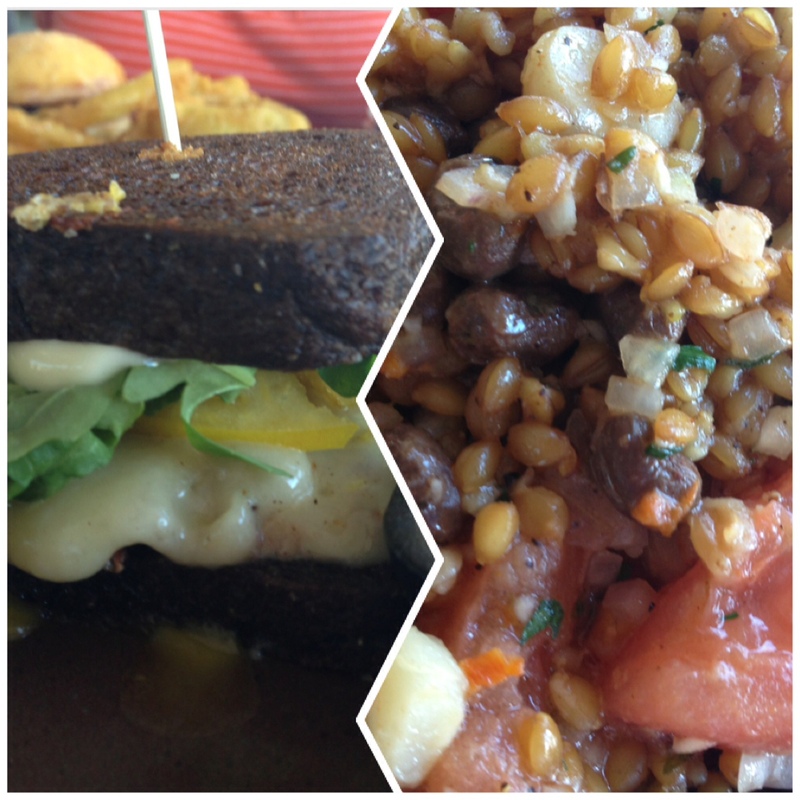 Tanner chose what he called the sandwich that “is becoming our signature sandwich” – the B.E.T., with a side of Farro Verde. Y’all, this sandwich…maybe it should be called the O.M.G. instead of the B.E.T.! The sandwich consisted of pork belly pastrami, Swiss cheese, fried duck egg, green peppercorn mayo, arugula, and yellow tomato. A fantastic combination – and expertly prepared! Note: the sandwich can get a little messy due to the runny egg yolk, but it’s worth a little finger licking to clean up! The side is definitely not one I would have picked out on my own since it’s centered around boiled peanuts – a snack I never really developed a taste for when I lived in SC. I’m here to tell you that when boiled peanuts are mixed with field peas, tomatoes, and hominy, they are DELICIOUS! Cindy and Greg were more than happy with their respective choices as well. Cindy chose a burger and onion rings (perfectly battered), and Greg chose the Pulled Pork Shoulder (served with waffles that have country ham in the batter!). And, I couldn’t resist taking a piece (or two – Bacon Bros. recently increased their dessert portions – the one thing about this restaurant that I would change – revert back to smaller servings of sweets) of Orange Dreamsicle pound cake home. I didn’t end up eating the pound cake until Sunday, and by then it was more dry than I would have liked. 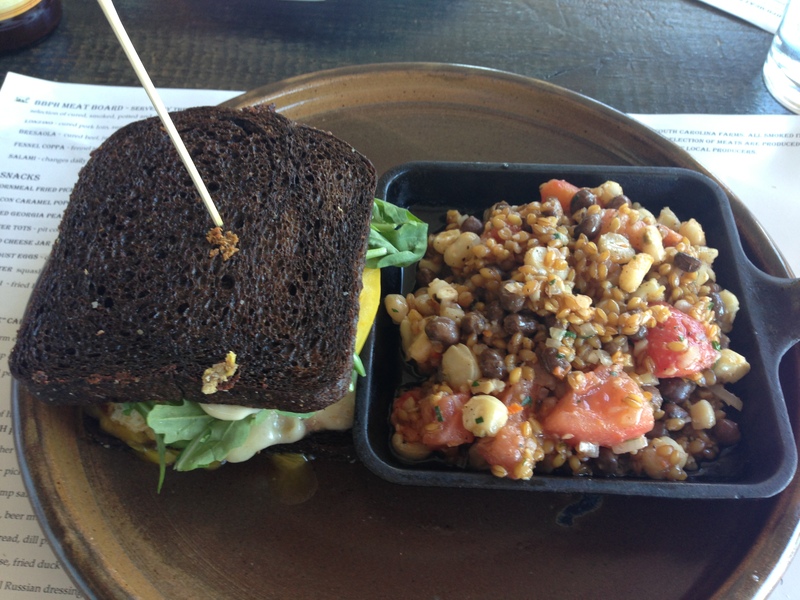 However, the flavor was very good – not too overwhelming with the citrus, but light and tasty. So, in addition to being amongst great company, Bacon Bros. Public House offered fantastic service, a unique and comfortable atmosphere, and spectacular Southern style food. We all agreed that it’s a place to go back and visit. Note to self: next time, I’m going to get one of those “Powered By Bacon” t-shirts! I should have picked one up last weekend. And, through Twitter, I learned that my colleagues in the Greenville area had also recently discovered Bacon Bros. and frequently visit for lunch. They had been holding out on me!!! 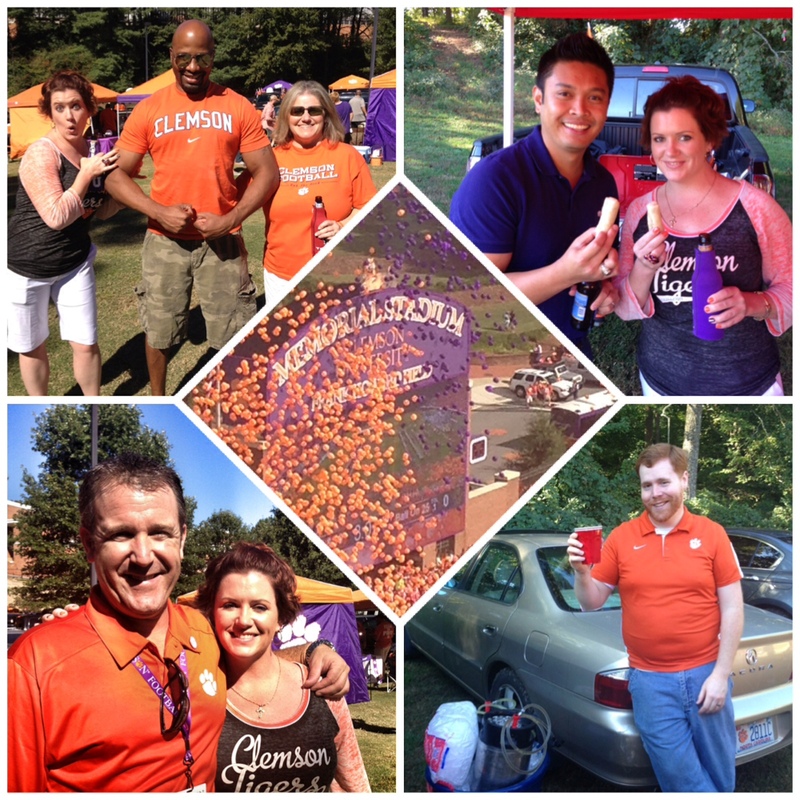 Because this trip was planned around meeting up with good friends to see my Clemson Tigers play, here are a couple of pictures from campus. L-R, CC: The guns!, beer and egg rolls, Shorter Porter (Frankly Good Beer Co), and my college roommate, Bill and me. It was a wonderful weekend – as time in South Carolina always is! If you’re in the Greenville area, I highly suggest finding time to make it to Bacon Bros. Public House. Have you been? What was your favorite Southern style dish? We supply pork, chicken. turkey, eggs and lamb to Bacon Brothers. Your experience there does not surprise me. These folks are absolutely wonderful to work with. Not only do they source locally, they make EVERYTHING in house. They really are artists! Thanks for reading this post, Steve. Even more so, thank you for providing a bit of an insider’s perspective! It’s great to know that a supplier of BB’s enjoys working with them, and that they make everything in house. Very cool! 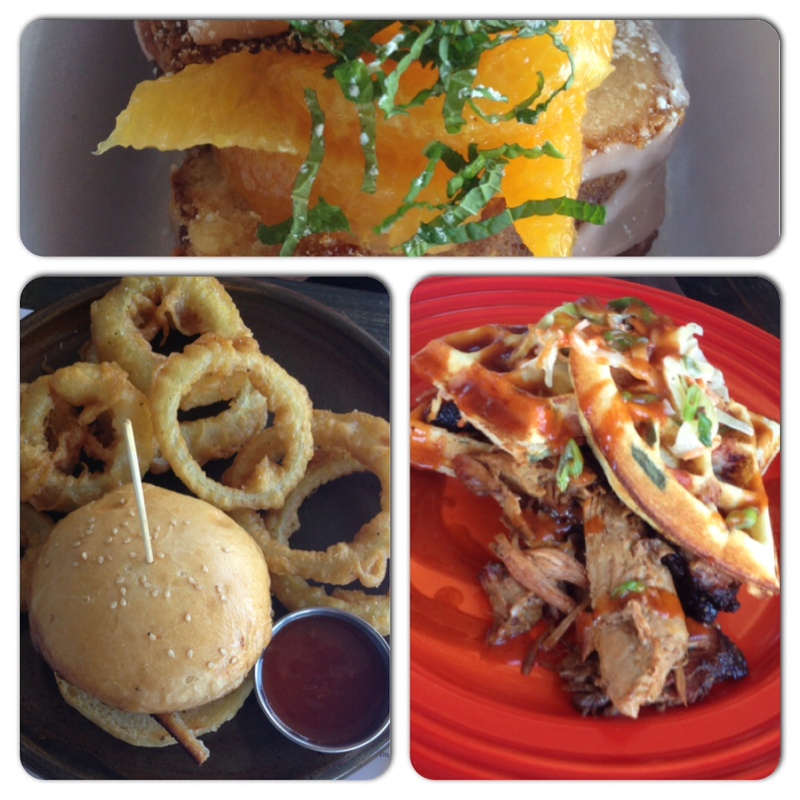 I’m looking forward to getting back down south for another visit to Bacon Bros. Public House!